CyanogenMod has added another feather in its cap. 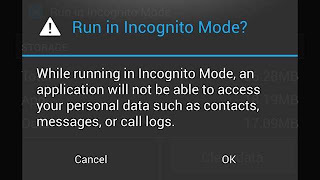 Now you will be able to load your Apps with a 'incognito' option where by you can control the access levels of the App. Steve Kondik, the famous developer of Cyanogen, has announced this new feature for his Android ROM, the CyanogenMod. 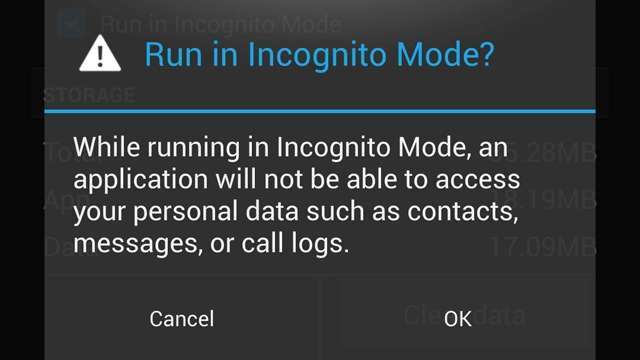 The new feature will ask the users for an option to run apps in 'incognito' mode. It will be a simple privacy feature that is designed to let users have more control over the data that is generally accessed by apps. Another beauty is that the new setting will be available for each application rather that a batch. So you get to choose the Apps which you don't want to give access to your personal data rather than a blanket setting for all Apps. Kondik was quick to point out that he wasn't providing a way to block ads or spoof device information, like IMEIs. Instead, this is a feature to simply let users have more control of their privacy on smartphones. So another beautiful feature, which I feel should also be available in regular OS of smart phones. But like always, the modders go where no OS has gone before.